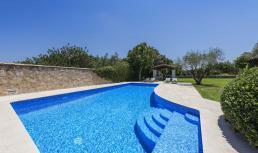 Holiday villa Paulette is located in an exclusive area near Pollensa in the north of Mallorca. Lovely country villa with 4 bedrooms, 3 bathrooms, air conditioning, WiFi internet and private pool! Villa La Font lies in a quiet villa area near Pollensa in the north of Mallorca, only a 5 min. drive from the beaches of Cala Vicente. Luxury, modern holiday villa with 6 bedrooms, 6 bathrooms, air conditioning, internet and private pool! This villa can also be rented for 8 persons (except July, August and Easter). Villa Emerald lies on top of a hill above a quiet residential area near Pollensa in the north of Mallorca, enjoying spectacular sea view. Luxury, modern holiday villa with 4 bedrooms, 3 bathrooms, air conditioning, WiFi internet and large infinity pool! Villa Clara lies in a lovely residential area between Pollensa and Sa Pobla in the north of Mallorca. Luxury holiday villa for 8 with 4 bedrooms, 3 bathrooms, air conditioning, WiFi internet and a swimming pool with Jacuzzi tub! Villa Eugeny lies in the sought-after residential area s’Ubac between Pollensa and Sa Pobla in the north of Mallorca. Luxury holiday villa for 8 with 4 bedrooms, 4 bathrooms, air conditioning, WiFi internet, heated a swimming pool and wonderful views across the valley towards the sea! Villa Rhoda lies in a quiet villa area within walking distance of Pollensa with restaurants and shops. It is an easy 10 min. drive to the sandy beaches of Cala Vicente and Port Pollensa. Luxury, modern holiday villa with 4 bedrooms, 4 bathrooms, air conditioning, WiFi internet and heated pool!